The spider jolted up and down like a yo-yo, industriously filling in a gap in the bush by the steps. Two large pine trees flanked the front porch of our little white house, but the bush, with its tiny warm weather buds and prickly branches, had managed to interpose itself between the steps and the pine on the left. I stared in fascinated horror at the spindly creature, the glow from the living-room window spotlighting the miniature trapeze act. The star of the show would be stationary in the morning, centered in its dew-covered handiwork, when I passed it on my way to school. My purpose in standing there after dark in pajamas and goose bumps was to chill myself thoroughly before running up the stairs and leaping under the covers, a ritual I’d devised to further enjoy the coziness of my bed. My room was on the back side of the house, one window looking out onto a vacant lot – vacant, that is, until I was five, when they moved the Dog House from Allen’s Crossroads – just picked it up and plopped it right down there. It was a hot dog joint, serving greasy meals to truck drivers and big, slurpy ice cream cones to the neighborhood kids. I spent a lot of evenings kneeling in front of the window, watching patrons get in and out of their cars. My other window looked out on the backyard, and beyond it the garbage dump, strewn with smoking ashes and bits of metal and broken glass that wouldn’t burn. From there we could follow the path through the elderberry patch into the woods that served as backdrop for our property on Route 71, the road to Pittsburgh. It was a small, two-lane road then, before they tore down our house and built a superhighway. My big brother Tommy occupied the room facing the front. From there he could see across the road to Kellman’s junkyard, a small white building fronting a lot full of broken-down automobiles of various makes and models. Their shabbiness detracted from the majesty of the row of huge sycamores that lined the road at the end of our yard. Catty-cornered from us, across the road, stood the rinky-dink Trocadero Café. It was a neighborhood bar, a place where locals gathered, including my mother and her friends, with increasing frequency it seemed as time went on. It was owned by a Russian couple with a large family whose living quarters was in back. Despite the futile presence of a solitary grape arbor standing tall at one end of its gravel parking lot, it further eroded the aesthetic value of our field of vision. Like life itself, our environment alternated resplendence and degeneration and offered us the ingenuity of man alongside nature’s intrigue. There was a coal mine under the ground, spewing its yellow sulfur water from a faucet into the creek that wound through the woods like a snake. Looking stark and out of place amidst the trees and brush, the big rusty spigot turned on, as though by ghosts, every day at three o’clock, making the creek rise slightly. I always stopped whatever I was doing and stared in wonder at the rising water, as though it were a new phenomenon each time. The creek ended in Jesse’s back yard, where it ran smack into a pile of slag with a railroad track on top. The train’s mournful wail announced the oncoming procession of the engine, with a waving man in a beaked cap, followed by several cars, and finalized by the distinctive red one. “There’s the caboose,” we repeated, liking the sound of the word. Jesse’s front yard held a mulberry tree, its bumpy little berries squashed all over our shoe bottoms. The side wall of his house was adorned with honeysuckle vines, me noticing the fragrance no matter how many million times I walked past them and circled into their garage. We played house in there, he the daddy coming home from work and I the mom fixing dinner and sitting him down to the kiddy table and chairs I’d set with miniature plastic flowered plates. It was the forties, when mommies stayed home and daddies went to work. True to the times, Mother cared for us and the house, with its kitchen nook and many rooms. She’d been a beauty, voted most popular girl in her senior year of high school, continuing to be well liked around our neighborhood – and creative. She made cakes and pies – even noodles – from scratch and every dress I ever wore. 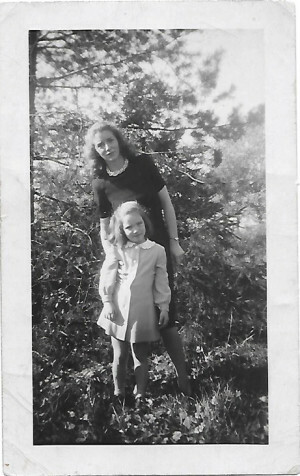 “I don’t see why I can’t have a bought dress like the other girls,” I pouted once after I began school, prompting her to sew a Kauffman’s label into one of her own creations and present it to me as a birthday present. “I wanna sleep with you,” I repeated, but instead he led me into my own room and tucked me back under my covers before disappearing into the dark hallway. While relieved of the imaginary bovine, I would nonetheless have preferred the risk of being smashed with his huge body to spending the rest of the night alone. I imagined so many things – that people were human beans; that the puffy clouds hanging in the sky were made of gauze, like the stuff my mother put on my recurring scrapes and cuts, firmly contained with a slab of white adhesive tape; that my stomach was a vast open area, whatever I ate plopping down from my throat as though dropping off a cliff. If I were full, it meant the food had reached the level of my chest and was closing in the space. I also imagined that, until right after my ninth birthday, everything in my little world would stay just as it was. Time and play were marked by seasons – diving into a pile of crispy brown leaves slated for burning in autumn, riding sleds face down in a neighbor’s snowy driveway in winter. Spring brought puddles around the back porch and thick mud that made the garden path squishy. Summer was sudden, alive, the air thick with butterflies and spider webs and the lightning bugs we imprisoned in mason jars, with jagged ice-picked air holes in the lids. During my final summer there, three days of continuous rain kept me inside, and once it stopped, I wandered off to the woods, sprinkles flying from the dripping bushes as I pushed my way through, jumping over puddles and becoming hopelessly muddy anyway. I stopped short at a clearing near the creek. Clouds and treetops darkened the space, like a room with the shades drawn, and nothing moved while the earth pulled itself together after the watery assault. The creek there had doubled in size from the rain. It never quite reverted to its former size, and I always viewed its girth as a deformity, not yet aware that the staples of my life could change – fall turning into winter maybe, me passing into third grade or outgrowing my favorite dress; these were constant, fluid changes in a world I thought would stay the same. There was talk of a highway that would be built in the area. “It’ll run right through your dining room,” was the prophecy. Each time I heard the words I envisioned a roaring mass of concrete, rushing toward the house, covering everything in its path like a flat avalanche. Yet, despite the image, for a long time it was simply talk, the periodic mention itself becoming one of those staples, like the side porch glider or the willow tree flowing above Mother’s flower garden. I could hardly believe it was real, even when I looked out the back window and saw the workmen tearing away the woods a month after her accident. It was one of those deaths that shocked everyone, somber clichés muttered in hushed tones: “I can’t believe it,” “the prime of life,” “those poor kids.” Dad looked stunned, silently cooking eggs for Tommy and me the next morning before relatives began arriving. Days later, I watched him pack up her clothes for his cousin Margaret, who was her size. Working fast, he emptied each drawer, dropping its contents into a cardboard box and slamming its emptiness shut, while I stared at his grim expression and wondered whether men cry. She’d been drinking again that night, with friends at the Trocadero. After standing in the window watching for her until long after dark, I’d run across the road and made my way past the bar and into the side room filled with wooden tables and music from the jukebox. Her walk was already slanted, her speech slurred, as she led me to a table adorned with half-emptied beer bottles and overfilled ashtrays. “I want you to come home,” I’d said to her, ignoring the fuss her friends were making over me. “Why can’t you come home?” I repeated, now in tears, disinterested in the bag of potato chips someone put on the table in front of me. Hopeless in my quest to persuade her, I ran home and slept angrily. “Get up and get dressed.” I thought I was dreaming my dad’s words two hours later, and only after my stubborn insistence that he tell me why, did he relent: “Your mother’s been hit by a car,” and I rose quickly. Once dressed, I ran downstairs, knowing Tommy would tell me whether it was real, this strange occurrence – the sort of thing that happened only to others – but when I reached the front door, I was alone. I could see bright flashing lights and crowds of people on the road. Wandering across the huge yard, I pushed through a circle of onlookers and found Tommy and my dad hovering over Mother on the side of the road where she lay, as though asleep, her dress torn and one shoe missing, unable to respond to her distraught son’s pleas, “Can’t you talk to me? Can’t you say something?” I heard a siren then, Oh, yes, that’s what they do when someone is hurt, call for an ambulance, my thoughts raced, but I said nothing. Tommy and I were separated when the ambulance arrived, he and my dad joining her for the ride to the hospital, and her friend Jeanne grabbing me by the hand to ride with her and her husband in their car, she wringing her hands and praying all the way. Tommy was waiting for me in the hospital hallway, where he was the stoic big brother, holding my arm and repeating, “Take it easy,” while I, in my stupor, hadn’t quite grasped the gravity of it all, not even sure I believed she was dead, until I heard it three times, the final confirmation in a statement from Jeanne to her husband. I awoke the next morning thinking it might have been a dream, until I checked Mother’s bed and found it undisturbed. Over the following days, as friends and relatives gathered for the funeral, airborne bits and pieces of information, from one adult to another, revealed what happened that night. The car that hit her kept going. It sped into her as she approached our driveway, knocking her several feet, the missing shoe in the brush and the winds so high a piece of her torn dress reaching a bush in Jesse’s yard. It had been my favorite of her outfits – a black skirt and jacket with a ruffled, white dickie. When honored with choosing her dress for the casket, I wished it could have been that one, but I somehow knew better than to ask and chose a pink one from her closet instead. Living with the spaces where she’d been was like trying to jump the widened creek, my foot falling short where earth should have caught it, the splat splashing unwanted water onto my clothes. I played; I went to school; I came home to no one. At night Tommy and I ate Dad’s fried potatoes or heated pork ’n’ beans ourselves. We did the dishes and never spoke of her. I wore dresses not quite pressed, my long hair not quite combed through. My dad’s Aunt Alice helped out when she could, washing our clothes, bringing food, once making a big bowl of vanilla pudding and leaving it on the kitchen table. I noticed it there, a bright yellow enticement in its baking dish with handles, and thought each time I passed in and out of the kitchen, “I’ll have some today,” but with no one to spoon it up, it sat untouched, until its surface turned bright green with neglect. Tamara Shaffer is retired and lives near downtown Chicago with her cat, Wishbone. She loves to write, particularly about her childhood in Western Pennsylvania in addition to short stories, which have appeared in various literary journals and Woman’s World magazine. She has written a book about a 1957 unsolved murder of two teenage sisters in Chicago.